When the weather forecast began to predict periods of heavy snow, I began to plan an image to take advantage of what could be the first measurable snowfall of a decidedly dry winter. Once the snow began to fall, I returned to the area where I made my recent Ice-Bound Abstracts images and walked along Goose Creek to find an area of the banks along the far side of the creek that would serve as the right backdrop against which to capture the snow in a very short exposure. The intent behind this image was to capture the warm colors and rough textures of the cliffs that form the banks of the creek. These had impressed me the last time I visited the area, and I wanted to experiment with using them as the backdrop of the snow, to create a layer of texture (the snow) on top of a background of texture (the cliff). I knew I needed the snow to be heavy enough to capture in the image, yet it had to be early enough in the snowfall that the cliffs weren’t yet covered in white. 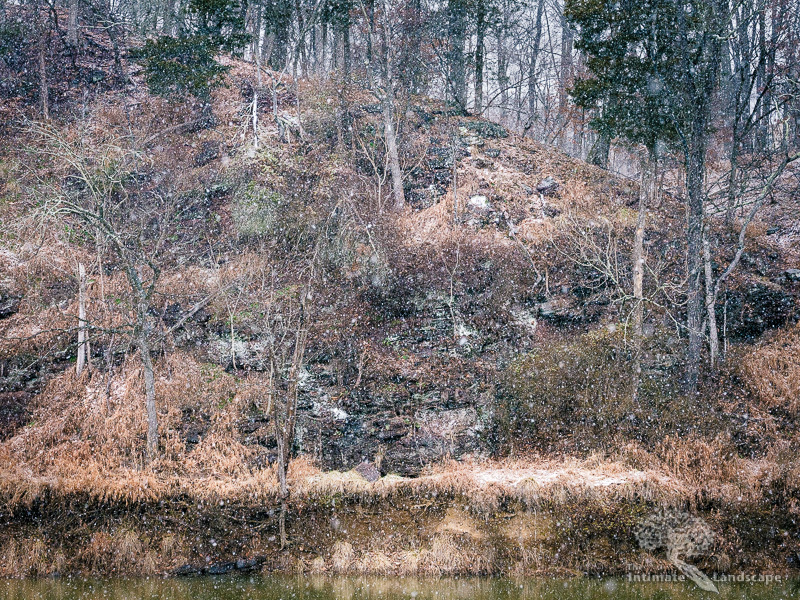 I knew the dried grasses and other vegetation on the cliff would be warm in tone as a counterpoint to the generally cool tones that a cloudy, snowy, sky would impart to the scene, which was another reason to capture the scene early in the snowfall before those warm colors became enveloped in white. The making of this image was also a bit of a departure from my normal technique in nature photography, which is to use low ISO, often with heavy neutral density filtration, to capture a scene using very long shutter speeds. I like the departure from reality that such technique provides. For this scene, the exact opposite technique would be needed: extremely high ISO with as brief an exposure as possible to create a different departure from reality; flakes of snow frozen still in the air above the creek. This image was made using a Fuji GFX digital camera with the Fuji GF 120mm f/4 lens. The exposure was 1/250th of a second at f/8, ISO 6400. Printing this image on cold-press watercolor paper even further enhances the textures captured in the scene. This entry was posted in Landscape Photography, technique, Winter and tagged Fuji GFX, Goose Creek, landscape, nature, Rocks, snow, texture, Trees, warm tones, water, winter.